I know this is unlike our usual blog entries – no photos! – but, this is important stuff. Our fabulous assistant, turned us on to a new MAC computer tech support. 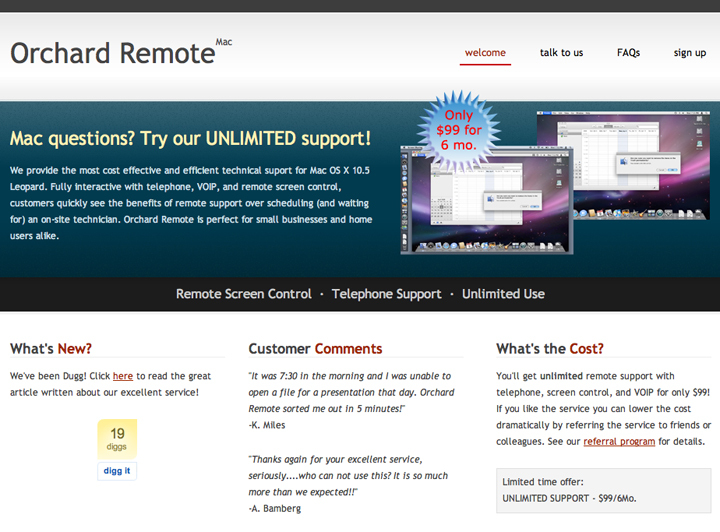 The outfit is called Orchard Remote, based here in Seattle, WA and run by two former “MAC Geniuses”. For $16 a month you can have unlimited phone support! For all you skeptics out there that are thinking that you need somebody on site each time (or feel like you have to drag your computers into the Genius Bar at Bellevue Square just to get good support) this is a great solution. The software these guys use allows them to log on to your computers remotely (with your permission and a unique pin code each time) and actually see what’s on your monitor, so you’re not stuck describing it. Even better they can take over and “drive” while you multi-task other projects. Since we signed up in mid-September we’ve used them three times – each time requesting “Help Now” (vs. setting up an appointment for later that day) and received a call within minutes of our request. Each time our problems were solved within an hour – and we were off and running….